This lesson addresses how sea level is determined and applied. It starts with a general discussion of the surfaces that form the basis of measurement, called datums, then looks more closely at the vertical datums that form the basis of height measurements. We cover tidal datums in more depth, including the different datums, their extent, period of record (called a tidal epoch), and common applications. 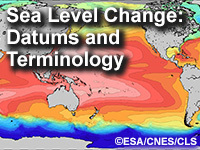 We conclude with a look at some data resources for tidal datums and sea level trends. It's useful for Surveyor and who study SST. This was a very good learning experience. The descriptions and diagrams were clear and concisely but thoughtfully explained. I improved my pre-assessment score to the quiz by almost 100%. I am a little surprised because during the quiz the correct answer for question 8 (related to reference used by NOAA for depth in navigation charts: MLLW) was not an option, Why??????? ?, that was really weird!!! I was pretty sure about the answer but I was not able to find, so I chose MLW. Check it, please. Satisfactorio, me ha parecido muy fascinante y realmente didáctico he aprendido mucho de esta lección. me encantaría adentrarme más a la parte técnica de los procedimientos matemáticos de los datos de marea y control por medio de la tecnología GPS. I work with tides and sea levels and consequently datums. While tidal datums are well understood Geoids and Ellipsoids are less so. Sheds light on a confusing subject, with practical implications. Very worthwhile. This works very well for both introducing people new to CO-OPS as well as a refresher for those who don't use datums on a daily basis. Important information and well done! Very good lesson on explaining datums. Good coverage of the basic concepts behind various vertical datums. Could use some coverage of methods for converting between datums (e.g. VERTCON or VDatum).